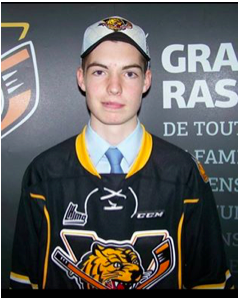 The Victoriaville Tigers have drafted Blackville School grade 10 student Daniel Moody to the Quebec Major Junior Hockey League on Saturday, June 4th at the EastLink Center in Charlottetown, PEI. Moody, who is a goaltender, played with The Miramichi Rivermen of the NB/PEI Major Midget League this past season. He was selected 130th overall (8th round) to the QMJHL. It was a dream come true. Especially to an organization like Victoriaville - a lot of new territory and people and more importantly an opportunity to make a Major Junior Team. Getting my named called was extremely exciting, and I am thankful to have the chance to showcase my talents at a higher level of hockey. Playing in the QMJHL has been a goal of mine for many years. Being able to be part of Victoriaville’s organization will hopefully open many doors for my future playing hockey and give myself a better chance to play on the team. Being drafted is an incredible way to pursue my hockey dream. The training camp will take place in Victoriaville in mid-August. Over the summer I would like to put on some weight and work to get faster and stronger, as well as getting on the ice as much as possible. What will be your plans after you graduate and what your hopes for playing hockey? Right now I am focused at taking one step at a time to play the highest level of hockey possible. As for next year, I will attend both the QMJHL training camp and MHL training camp and return to the Rivermen if I am not successful in cracking either lineup.